It was arranged at very short notice, but our brief visit to the High Atlas over Christmas and New Year, was as enjoyable as any week’s holiday I’ve ever had. 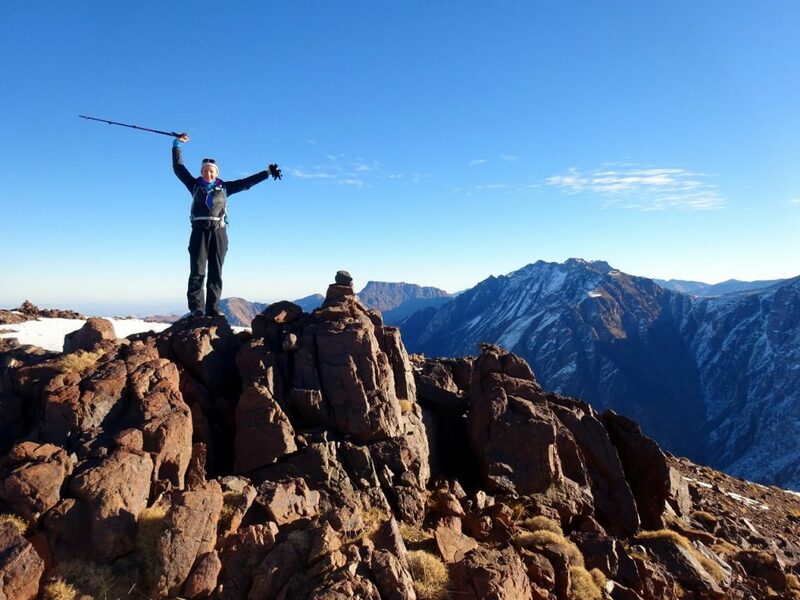 I found a local trekking agent Pathfinders Treks on TripAdvisor, and was impressed by their owner Rachid’s almost instant response to my enquiry, offering a fair price for precisely the services we needed – a guide, cook, mule, food, transport to Imlil, and accommodation at both Imlil and Toubkal. There proved to be no catch. Apart from a tiny hiccup with our airport transfer at the end, we were very happy with everything they provided. I can also highly recommend the hotel we found in Marrakesh, the Riad Sadaka, a genuine Moroccan-style riad built around a central courtyard, tucked away in the narrow alleyways of the old city, and with a pleasant roof garden looking across the rooftops. 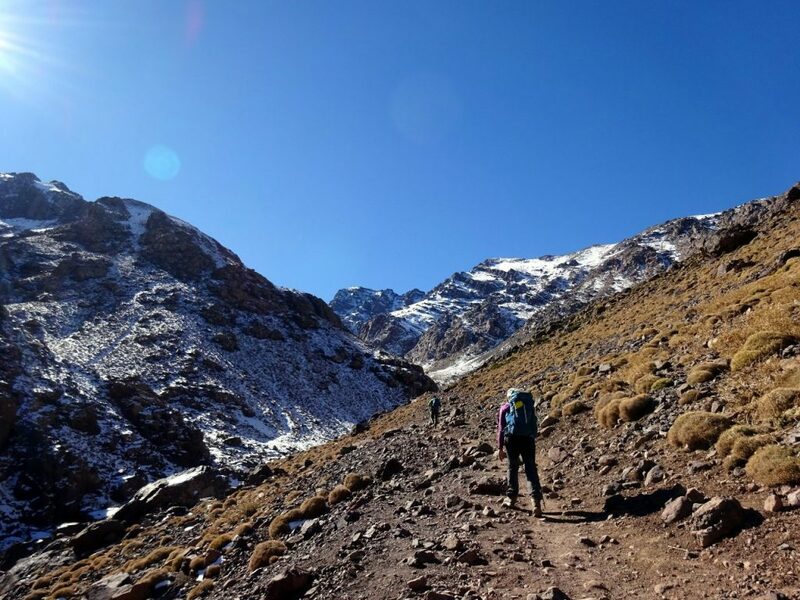 Our plan was very simple: to spend a few nights at Toubkal Refuge in the heart of the High Atlas, and bag a few 4,000m peaks as day hikes, including 4,167m Jebel Toubkal, Morocco’s highest mountain, which is also the highest mountain in North Africa. It would be my third ascent of the peak, and there would inevitably be some repetition of my trip three years ago, but for Edita it was all new. In fact conditions were quite different from my last trip. Rachid himself met us at the airport and explained that there wasn’t as much snow this year. In fact there was to be no more snow that week, which meant we experienced great weather, but it also meant there was even less snow by the end, and our crampons were coming on and off like 007’s trousers. I was expecting our accommodation in Imlil to be fairly basic, a dormitory with a shared bathroom down the corridor, but Rachid proudly announced that he’d booked us into the no. 1 hotel on Booking.com. The Riad Jnane Imlil proved to be just that (at least among the hotels in Imlil). At an altitude of 1,800m and hemmed in by surrounding mountains, Imlil can be chilly in winter, but our hotel was warm and comfortable, and I was surprised to find that we had a private bathroom. The only drawback was a notice outside the front door saying ‘Strictly No Alcohol’. 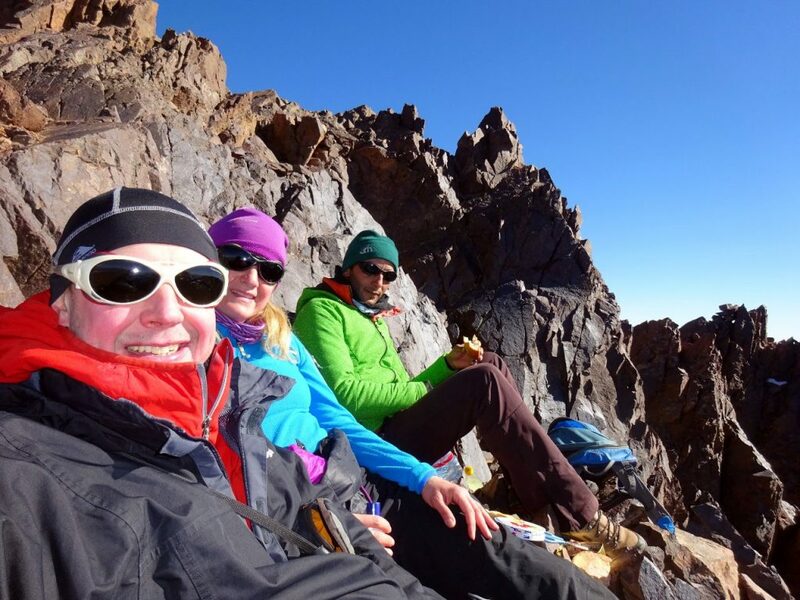 It was Christmas Day, and the remainder of the bottle of wine that we’d brought from Marrakesh would have to wait until we reached Toubkal Refuge. We met our guide Lahcen the following morning, a Berber and native of Aremd, the highest village in the valley on the way up to Toubkal. A guide can make or break a trip. I’ve rarely had one that I’ve not been able to get on with, but some have been more flexible than others. On a private trip like ours you need a guide who is prepared to discuss the options, and change plans if necessary. In this respect Lahcen turned out to be one of the most easygoing guides I’ve ever had, for the simple reason that if it wasn’t something he wanted to do himself, he was quiet happy for us to do it on our own while he waited. This wouldn’t be everyone’s cup of tea in a guide, and it certainly wasn’t textbook guiding, but for us in the moderate terrain of the High Atlas, where we weren’t going to be doing anything very technical, it worked well. 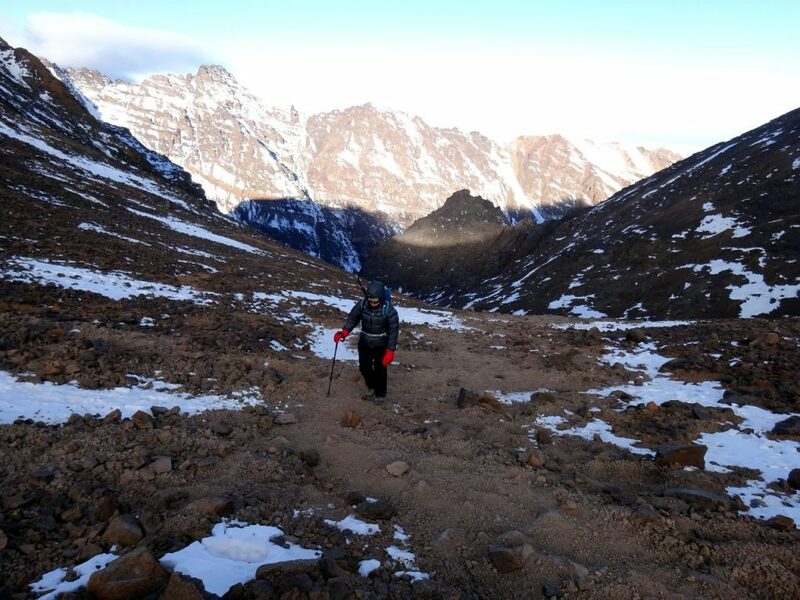 It took us six hours to walk up the 1,400m from Imlil to Toubkal Refuge at 3,200m. We ascended a now familiar trail that climbed the left side of the valley, then turned to the right and crossed the river at a small shrine where teahouses have been built for the pilgrims. The landscape was fairly rocky and barren, though isolated clumps of juniper could be found right up to around 2500m. As Rachid had warned me, there was far less snow this year. Three years ago the whole valley had been thick with snow, and we needed to wear crampons above the shrine. This time there was snow on the mountains, but the trail was largely free of it but for a few short sections of ice. It was quite safe to walk all the way up to the refuge without wearing our crampons at all. We stopped for a lunch of salad and mint tea at the last isolated teahouse high up the valley, just before the trail swung back to the left for the approach to Toubkal. Two mountains came into view at the top end of the valley as we approached the refuge. The first of these was a gentle pyramid with a cleft in the middle. This was Ras n-Ouanoukrim, a peak that I climbed last time I was here, and was expecting to climb again. 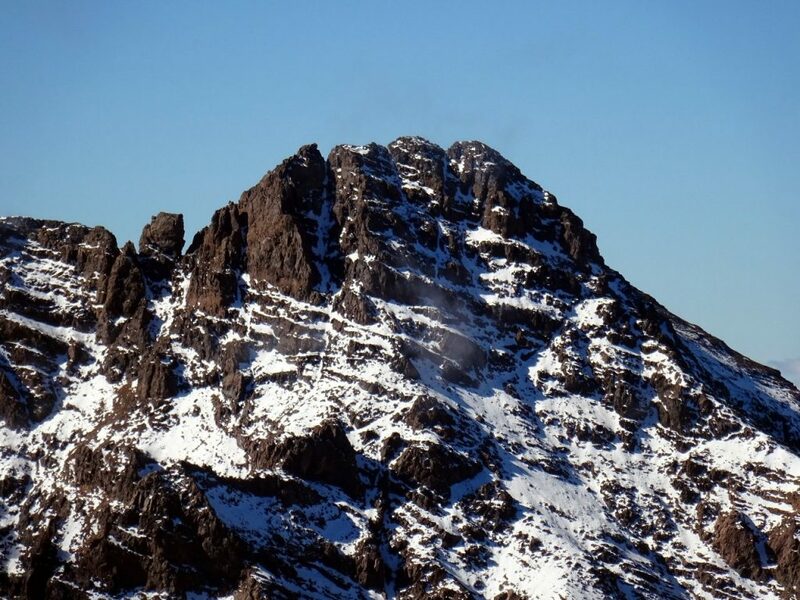 The second was a more complex formation of multiple summits called Akioud. It was one of the new 4,000ers I hoped to climb this time around. Jebel Toubkal isn’t visible from the approach to Toubkal Refuge, but I knew it to be hiding beyond the gully rising to the left directly above the hut. 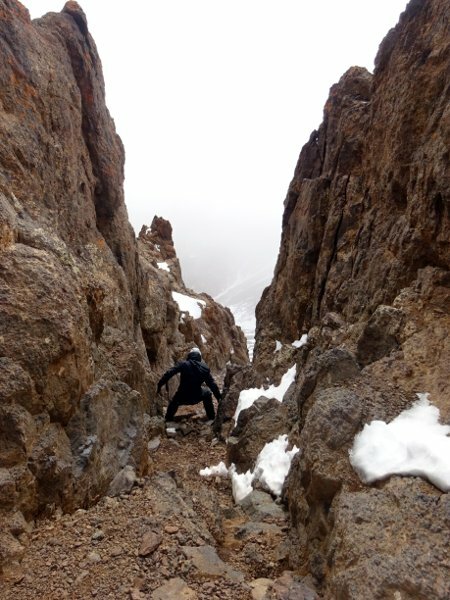 There is a parallel gully north of this one which my guidebook Mountaineering in the Moroccan High Atlas said provided an alternative route up Toubkal. As we approached I asked Lahcen about this option. He suggested we go up by the normal route, but we could come down the parallel gully. 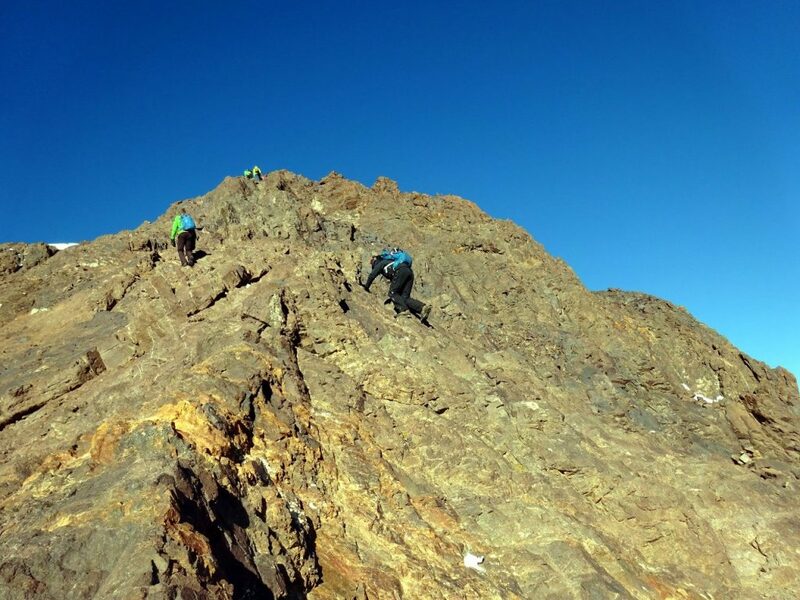 He said there were some interesting peaks on Toubkal’s northern ridge that we could climb before we came down. He said that one of them contained something rather special that wasn’t mentioned in my guidebook. When we reached the refuge I spoke to a pair of rock climbers about the climbing conditions. They had been there a few days, and said the lack of snow had turned alpine routes into technical rock climbs. It also created rockfall risk on some of the routes that ascended gullies. As an example, they told me about Biguinoussene, another 4,000m peak, which they had ascended by means of a gully earlier in the week. When they looked at it today, they could see that it was all rock and not recommended. There wasn’t much we could do but see which routes were feasible. As I spoke to them, they were busy sorting through sacks of technical ironmongery. We weren’t equipped for rock climbs like they were, and we would have to make our decisions from day to day as the conditions dictated. Over the course of the next few days, we did a number of different hiking routes up the surrounding mountains. 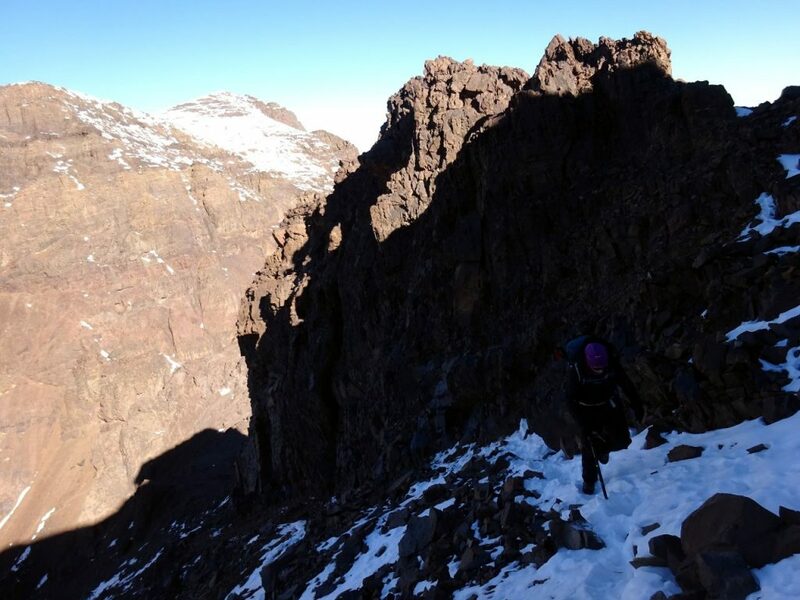 On the first day we followed Lahcen’s advice and climbed Toubkal (4,167m), coming down by a non-standard route. As soon as I went downstairs for breakfast, I recognised Omar, my guide from three years ago. He was guiding a big group of 12 clients from KE Adventure Travel, and didn’t recognise me initially, but I took off my hat and told him who I was, and a twinkle of recognition appeared in his eyes. He said he remembered me. I don’t know if it was the shock of seeing my bald head, or he was just being polite. We set off for the summit at 7am. The sun hadn’t quite risen, but there was enough light for Lahcen and Edita to start without head torches, and I switched off mine soon after leaving. There were a couple of groups leaving at the same time, but our smaller party was able to move past them and start pulling away. We weren’t roped together, which meant Lahcen and Edita pulled away from me too, but every so often they stopped for me to catch up. 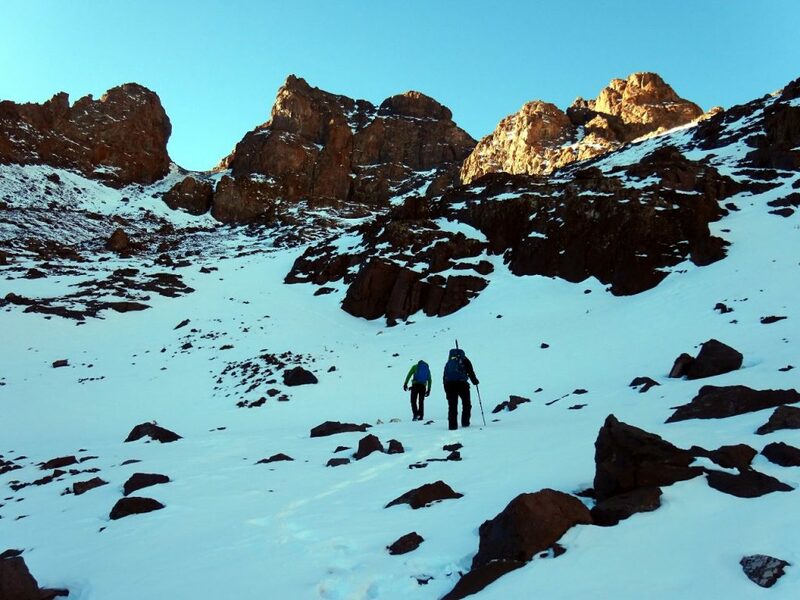 The route above Toubkal ascends steeply up a broad gully to reach a high combe. This is a hike in summer. Although we needed crampons for the first section, there was far less snow than there had been three years ago, with quite a lot of bare rock. This became more evident higher up, where the wind had scoured the slopes of snow. 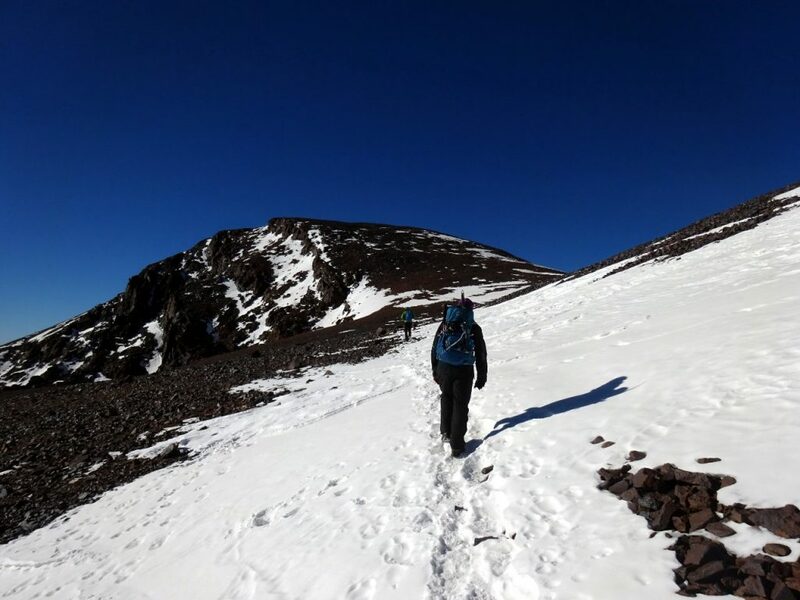 We reached the combe and climbed to the right up to the col between Toubkal and Toubkal West. 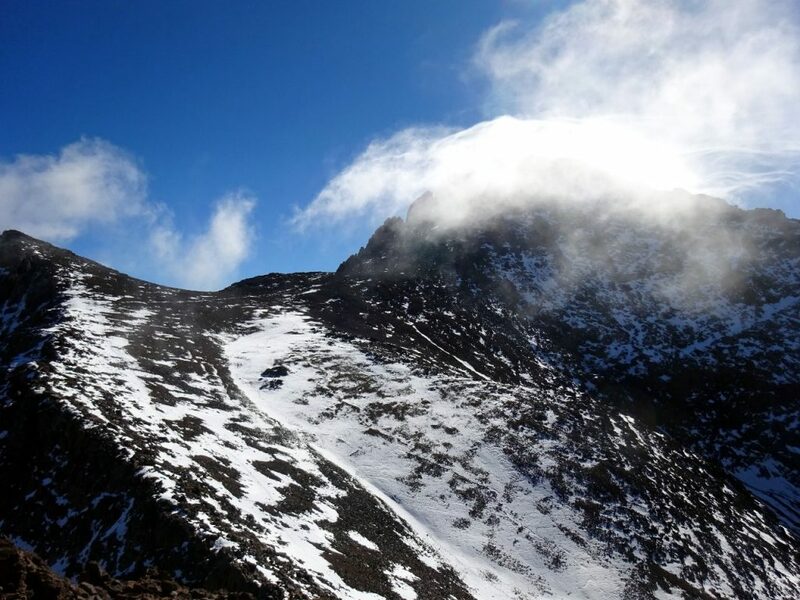 Above us, a fierce wind was lashing the summit, and fine clouds whizzed past overhead. Snow was scarce, and as we stopped to remove our crampons I was amazed to see a group on their way down. ‘What time did you guys get up then?’ I asked them. It was bitterly cold, even now. If you ask me, this obsession some people have with completing the entire climb in the dark to watch a sunrise from a freezing cold summit is barking mad. The sun rises every morning and you can watch it anywhere, but mountain views are rare. Don’t waste them by climbing with your eyes blindfolded. ‘You must have been freezing,’ I said. The wind hit us hard as we plodded slowly up the summit ridge. I had given my buff to Edita, and now my face was freezing. I could no longer feel my nose, and had to rub it with my hand to check it was still there. 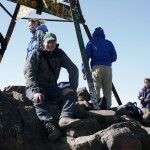 We crossed the summit plateau and reached the distinctive summit triangle at 9.50. It was deserted – bleak and windswept. I took my gloves off for some summit photos, but my fingers quickly became freezing. Everything, my hat, my trousers, jacket and zips, were lined with frost. We appeared to be in some sort of ghostly summit cloud. Views were faint, but it was only the wind causing the freezing temperatures. Lahcen was waiting in a sheltered spot just a few metres below the summit where it was pleasantly warm. We sat there for a few agreeable minutes, eating some snacks and watching a squirrel nibbling at crumbs, then headed back out into the biting Arctic winds. The ridge descended steeply from the summit plateau and we dropped about 200m until another peak, Imouzzer (4,010m) emerged on the ridge ahead of us. This seemed like an easy opportunity to bag another 4,000er. It only looked ten minutes to the top, but there was a catch. I was the first to arrive, and I could see another ridge extending off to the right. The summit was a short distance along to the right, but there were some gaps on the ridge, including a notch about 5m deep beneath the actual summit. I had to drop down to the right to look for a way across. ‘I’ll wait here,’ said Lahcen, after peering down the gap. He admitted to me later that he’s only ever come here in winter, when all 5m of the notch are full of snow and you can just walk across. I scrambled down to the right and reached a chute leading up to the foot of the gap, but I could see there was no way up the other side. There was a steep precipice below me, and it would be a very exposed rock climb to get up the last few metres to the summit. We were not equipped for this. Briefly I tried another route, scrambling to the right of the summit, but here I encountered very soft snow that fell away beneath me, leaving steep rock. It’s not for lack of trying, but the summit wasn’t in condition today, and we left Imouzzer for another time. We returned to the original ridge and Lahcen led us to the next summit along, Tibherine East (3,880m). It was a peak with the strangest summit monument I have ever seen, but as I wrote about that a couple of weeks ago, I’ll let you read the post if you’re intrigued to know more. The weather was glorious now, and we had lunch in the sun. From the summit, we could see straight down to Imlil, and the plains of Marrakesh beyond. Above us we could see a single lenticular cloud hanging across Toubkal like a ghostly flying saucer. Toubkal had its own ecosystem when all around was fine. We didn’t need to imagine that the summit was getting hammered – we had felt it. A lenticular cloud was hanging across Toubkal like a ghostly flying saucer. Imouzzer is to the left. 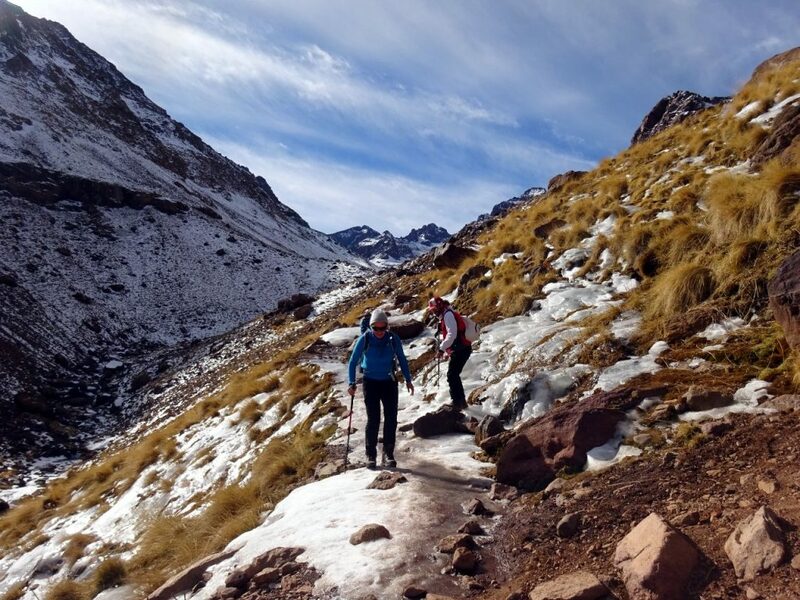 It was a straightforward descent down the north-west couloir, a valley parallel to the one we took up Toubkal. It was a mix of snow and rock, slippery in places. I didn’t see the sense of carrying my crampons in my pack, so I put them back on again. It was a hot slog, and I was quite tired by the time we got back to the refuge at 2.30. But this was our first day above 4,000m and I expected to feel stronger over the next few days. Later in the afternoon I had a chat with my old guide Omar. I asked him if it was normal for the weather to be awful on the summit of Toubkal while all the surrounding peaks were clear. ‘I think today we had special weather,’ he said. I took that to mean ‘no’. The next morning we gave ourselves an extra half hour in bed, had a leisurely 6.30 breakfast and left at 7.30. The extra half hour meant that it was completely light by the time we set off. The first part of the climb up Ouanoukrim was a gentle walk to the pass at the top end of the valley. It was an easy way to start, in shade, but not cold at all. We were amused to see a group of unguided Catalan trekkers scrambling across slopes to our left. 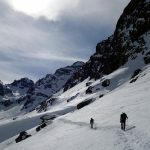 They didn’t realise that the route up Toubkal goes straight up the steep gully above the refuge, and must have set off up the valley looking for another opening. How they missed it, when the trail is quite visible and lots of other people were walking up it, was something of a mystery. We made good progress. The trail steepened on zigzags to reach the pass, where we caught up a couple of big groups. It was windy at the pass, but nothing like as windy as yesterday. The slopes above were wind blasted, with much of the snow blown off. We sheltered behind a rock and took off our crampons. For the next half hour we had an enjoyable scramble up a ridge. When I came here three years ago, Omar made us rope together, but there’s really no need. The scrambling was easy, with plenty of hand and footholds, and some sections of walking along the ridge between rocky outcrops. Above the ridge the path traversed to the left, under Ras n-Ouanoukrim (4,083m), towards the plateau-like summit of Timesguida n-Ouanoukrim (4,089m), Morocco’s second-highest peak. The view was splendid, with not a cloud in the sky. 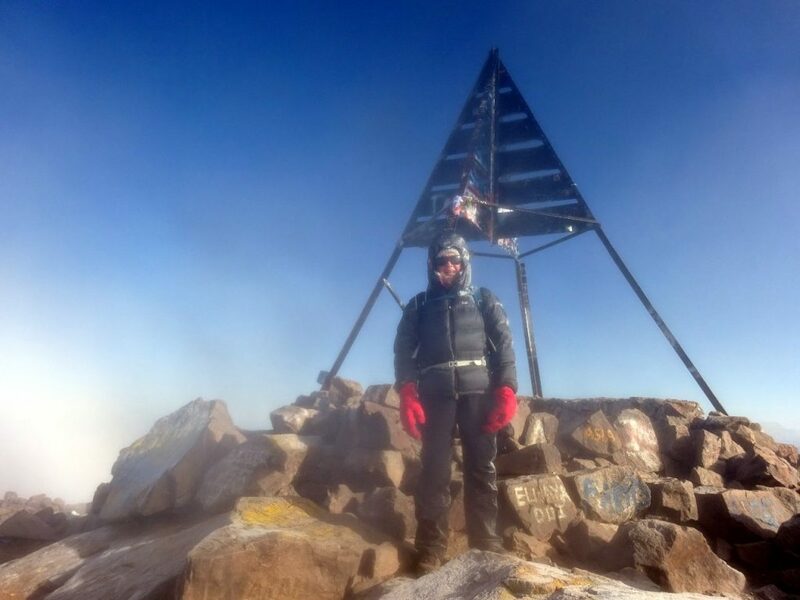 Toubkal was clear today – no lenticular cloud, and not the ‘special weather’ that we had yesterday. It’s a nice looking mountain from Ouanoukrim, with a prominent high point, a gentle ridge to the summit, and buttressed cliffs on the south side. We crossed gravelly slopes to the col, then walked up Timesguida. 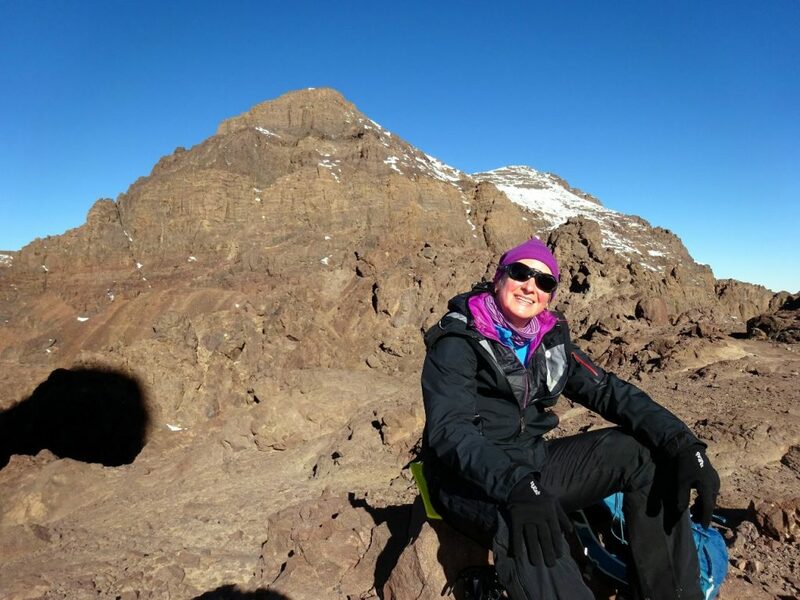 It’s one of my favourite summits, on the far southern side of the Atlas spine, with long views across southern Morocco. We reached the top at 10.30. The summit is a plateau, but Lahcen found a small dip and some rocks to sit behind and shelter from the wind. In front of us was a landscape of lower peaks stretching as far as the eye could see. I pointed out the Anti-Atlas Mountains to Edita: 3,200m Siroua, which contained a dusting of snow, and the more distant 2,500m Jebel Aklim, which I climbed on my first visit to Morocco 15 years ago. To our right were more peaks of the High Atlas, and behind us a nice panorama of the backside of Akioud, Ras and the Toubkal valley. We spent 20 minutes there, wandered over to a second cairn on the edge of the plateau for some summit photos, then left for Ouanoukrim’s second summit, Ras n-Ouanoukrim. We dropped to the col and back up the other side. Ras n-Ouanoukrim has two summits, and to get to the second higher one we had to drop down to a notch and scramble back up again. It was a much smaller summit, which we had to ourselves. As usual Lahcen reached it ahead of us, and was sheltering on a ledge just beneath the summit when we arrived there. It was an airy perch, but very warm, looking west across the Tizi n-Test pass. We stopped for about 20 minutes and a light sandwich. As we scrambled back down Ouanoukrim’s eastern ridge, we saw a young guideless couple ahead of us going completely the wrong way – off the ridge down steep rocky slopes. They were slopes which were clearly going to terminate in cliffs. It was a crazy route to take, and I wondered what they were thinking. Outside the big trekking groups, we were rare among the trekkers at Toubkal Refuge in that we were climbing with a guide. We choose to travel this way to make the trip run more smoothly, and because in Morocco guides are relatively inexpensive. 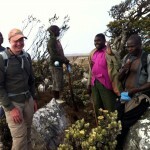 By hiring a guide and a cook, we are providing employment and helping the local economy. But here in the High Atlas, the trekking is straightforward. Experienced hikers like ourselves can easily travel without one too, but you need a wise head. The couple saw us scrambling along the ridge above them, and cut across its flanks to follow us. Back at the col, we put our crampons back on and returned down the valley to the refuge. It was warm, but not as sweltering as yesterday, and a much easier walk. There was a nice view down the valley towards Imlil, with the plains of Marrakesh far below us to the north. We arrived back at the refuge at 1.30 after just six hours of walking. It had been a nice easy day, but very rewarding. Our plan the next day was to climb 4,030m Akioud, a mountain next door to Ouanoukrim that would be a new summit for me. Our sleep was disrupted the next morning by a medical emergency. We didn’t know what the problem was, but the young woman in the bunk above me was clearly in severe pain. We were woken at 4am, and everybody in our dorm spent the next two hours trying to understand Toubkal’s emergency evacuation procedures. Surprisingly for such a popular trekking destination, they appeared to be quite rudimentary. There was no doctor at the refuge, and by six o’clock it was concluded that she had to be carried down to Imlil on a stretcher. Four porters were hired for the task. By then it was breakfast time. We’d lost two hours sleep and had a surreal start to our day, but the rest of it proceeded normally. We understand the casualty reached Imlil safely, from where transport to Marrakesh was available. On the way up to Akioud. The route passes through the cleft between the shaded and sunlit cliffs. But we used their help later, by following the very clear trail they left behind. I was impressed by their route finding. Lahcen didn’t appear until 7.30, just as we were ready to leave. He’d had a rough night too, and was ill. We started by walking up the valley in the same direction that we took to Ouanoukrim. After about half a mile, Lahcen diverted to the right up a narrow gorge. It was short and steep, with a few frozen waterfalls. After about 200m of ascent, we emerged at the top end, and crossed a strange section of something resembling dead thistles. Above us a wide, sloping valley led up to what looked like a series of passes. On the horizon above us were a number of rock walls, one of which was Akioud. The snow was quite thick. Illness or no illness, Lahcen did some sterling work breaking trail up the valley, aiming for the clefted rock face of Akioud. He was still much faster than I was, and when I caught up with him, he was sitting on a rock coughing. ‘Are you OK, Mark?’ he said. There appeared to be three passes above us, and the one we wanted was the cleft in the middle of Akioud. A snow ramp led up to it, between the cleft. Once at the pass, the route turned left and kept to the ridge on the far side. We could see the route up to the pass and it looked OK – a steepish snow slope, but nothing too frightening. What happened on the other side was anyone’s guess, but the sun was on that side, so it was likely to be free of snow. ‘You will see the trail,’ said Lahcen. ‘You are happy to be the guide?’ Edita asked me. It didn’t look intimidating. Easy snow slopes and easy scrambling are things I have plenty of experience with. The problem was going to be the route finding, but Lahcen had given me very clear instructions. Not everybody would approve of a guide who pointed out the route to his clients then returned to the hut for some rest, but we were quite happy with the arrangement for a peak that was no more than a winter hill walk. We said our goodbyes, then Edita and I set off up the slope, aiming for the cleft between the rock walls above us. We didn’t have to go far before we came across the footprints of the German brothers, as clear as any trail. The snow was not in good condition. There was a hard crust on top, but there was not enough for the slopes to avalanche. The conditions were difficult. The snow was soft underneath, and our crampons were constantly striking rock. We made slow progress, but the pass above us spurred us on, and we expected conditions to be different on the other side. Towards the top we traversed diagonally across a scree slope. The cleft narrowed, but when we squeezed through it, we arrived on an oasis of calm. The pass was a broad plateau, and it was warm. We had been in shade coming up the snow slope through the cleft, but now we were in sun. The ridge above looked steep but do-able. It looked to be mostly on rock, so we decided to take our crampons off and leave them at the pass. We stopped for a few minutes to put on sun cream. To the north, a flat-topped peak, Afella (4,040m), rose above a wall of rock. But our attention was drawn to the other side. We started slowly up the south ridge of Akioud. The route led up slopes of rubble beneath a wall of rock. As Lahcen had said, there was a clear trail of dust leading up in zigzags. There were short sections of snow to cross, but they were not slippery, and it was a good decision to leave our crampons behind. Sooner than I expected, the summit cairn appeared above us. We reached the top at 11.15 after crossing some slabs. It was very compact, but free of wind. It was my favourite summit too. We were right between Toubkal, Ouanoukrim and Afella, and looking straight down the valley towards Imlil. 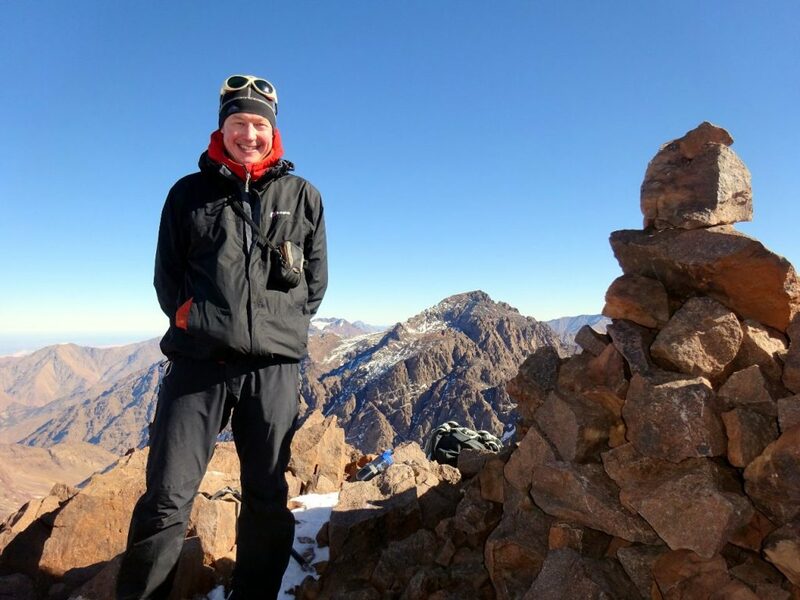 The three peaks around us all had their own character – Afella with its two flat-topped summits, across the valley Toubkal with its profusion of buttresses, and behind us Ouanoukrim, a gentler camel back with two distinct humps. To the west we had a new view of a long ridge leading down from the plateau’d summit of Tazaghart, to the Tizi n Test pass, and beyond it the western Atlas. Best of all, we had this peak completely to ourselves. We had some snacks leaning up against the summit cairn, looking across a gap in the ridge to Ouanoukrim, the mountain we climbed yesterday. It was busy then, but today we couldn’t see a single figure on it. Lunch was blissful, and we could have stayed much longer, but we didn’t want Lahcen to get worried and send out a search party. We took great care descending down the steep rubble above the pass, and then the snow slope below the notch. It was one o’clock when we reached the safer ground where we left Lahcen. We stopped for oranges in the sun, but soon afterwards the sun dropped behind the rock wall of Akioud. Edita led the rest of the descent, down the broad valley, then the narrow gorge, and finally the flatter main valley back to the refuge. We got back at 2.15, after our favourite summit of the week. 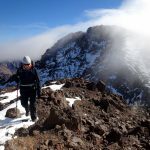 On the fourth day we had to return to Imlil, so we chose to climb 3,650m Aguelzim on the way, the peak at the far northern end of the long ridge that crosses the whole spine of the High Atlas, embracing Ouanoukrim, Akioud, Afella, Biguinoussene, Tadat, another peak whose name escapes me, and finally Aguelzim. 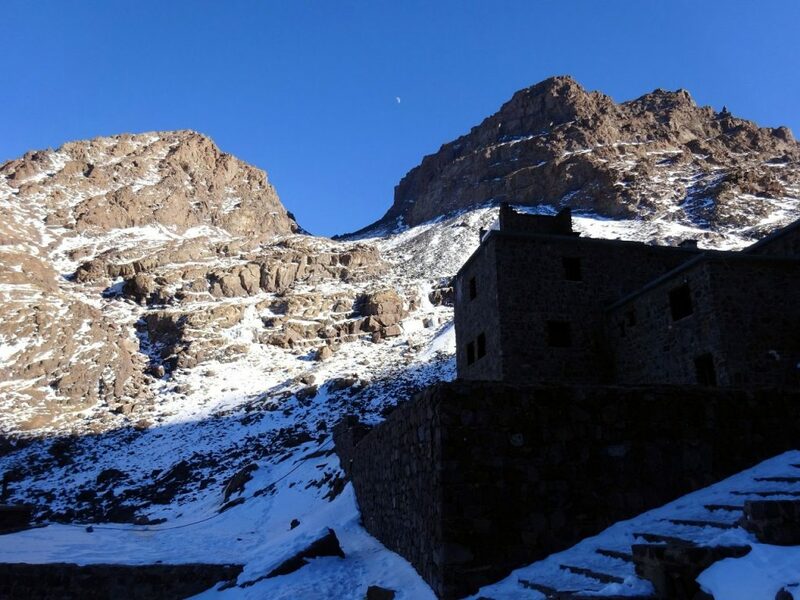 We packed up our duffle bags for our cook Hussain to take down with the mule, and vacated our comfortable dorm in Toubkal Refuge, our home for four nights. We left just before 7am. It was mostly dark, but there was just enough light to see where we were going. We headed down the valley in the direction of Imlil, but soon after leaving the refuge, Lahcen diverted left on a trail that gradually rose up the west side of the valley. There were patches of snow on the trail, but not enough to warrant crampons. 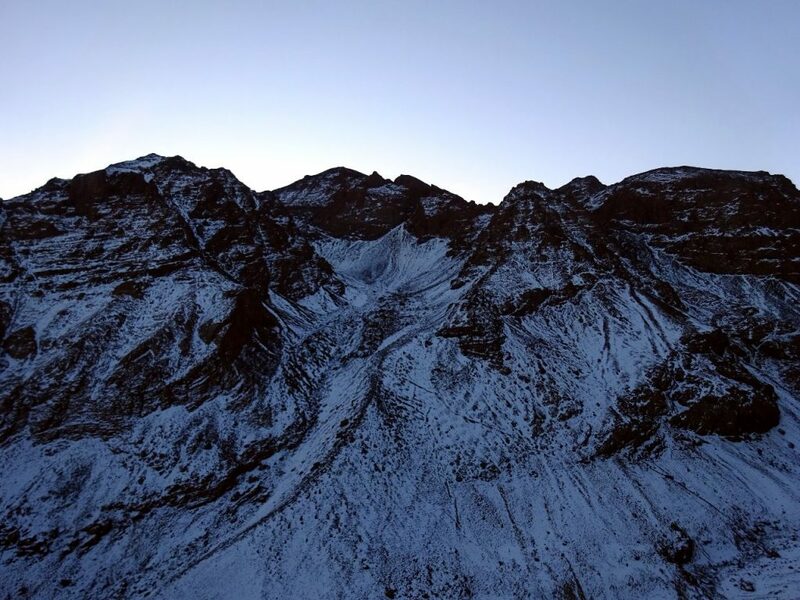 The sun was rising behind Toubkal, and we had a new view of Morocco’s highest mountain, a peak that until now we’ve only really been able to see from the south-east, on the summits of Ouanoukrim and Akioud. The trail contoured diagonally beneath Afella and Biguinoussene, zigzagging more steeply in places. It was a pleasant trek in high mountains, and nice to have the trail to ourselves. Aguelzim, it turned out, wasn’t a very distinctive peak – more like a high point at the end of the ridge – but it was a nice viewpoint. We reached it at 9.15, and found ourselves on the north side of the High Atlas. The view to the north is quite different to the one we had to the south from Ouanoukrim. From the south there are mountains as far as the eye can see, but to the north it is mostly flat. Marrakesh was just a short distance away, but it blended in with the plains and was barely visible. We had a good view of the ridge leading north from Toubkal, and also the ski resort and peak of Oukaimeden (3,273m) that I climbed 14 years ago. It felt like quite a prominent peak, but from the top of Aguelzim it was a fairly innocuous bump at the north side of the High Atlas. We lost Lahcen somewhere on the descent, when he raced off down a shortcut to join the main trail down to Imlil. Edita and I returned the same way, almost to the refuge, before we turned back down the valley. The trail was icy in patches. We caught up with Lahcen as he waited for us in a teahouse. 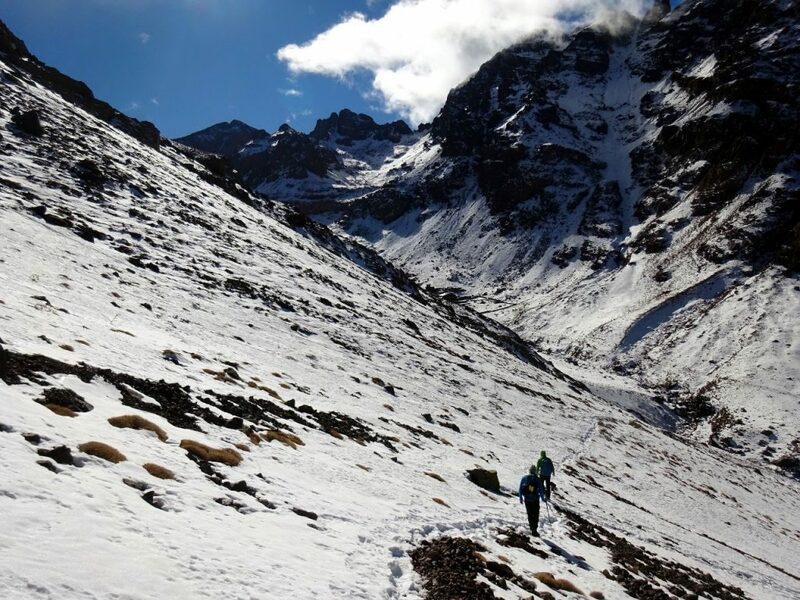 The trail was busy, with many people heading up to Toubkal refuge. A lot of them were Moroccan. It was a Saturday. We reached the shrine at midday, and waited for an hour and a half as Hussain prepared a lunch of egg tagine. We sat on a terrace overlooking the village, and watched all the people coming up from Imlil. A big English group took over the terrace and surrounded us as we waited. I overheard their guide telling the clients that local women come to shrine to improve their chances of having babies. As we continued down to Imlil we saw many local women coming up, clearly too tired and unfit to be regular trekkers. Lahcen confirmed the story I overheard from the guide, but he said that while many people believe in the shrine’s fertility-giving properties, he is not one of them. This was partly explained when he went on to tell us that he has seven brothers, three sisters, and three children of his own. Clearly his family have no need for any divine favours in this respect. As we approached Aremd, we looked back up the valley at Toubkal and Aguelzim. Mountains are deceptive. From that position the latter looked far more distinctive, and we had descended nearly 2,000m since we stood on its summit a few hours earlier, yet it was merely a bump on the ridge. By contrast Toubkal looked far less impressive than it did from Ouanoukrim. We had enjoyed them both. At dinner that evening I spotted Hamish Brown’s The Mountains Look on Marrakech on the bookshelf in the dining room, about a 96-day trek the length of the Middle Atlas and Moroccan High Atlas to the Atlantic. When I read his book Hamish’s Mountain Walk, about climbing all the Munros in a single trip, I found his habit of walking the Scottish Highlands in just his boots and underpants a bit weird. I hope he didn’t do that in Morocco, where people dress more conservatively. In any case, it was another book for my reading list. 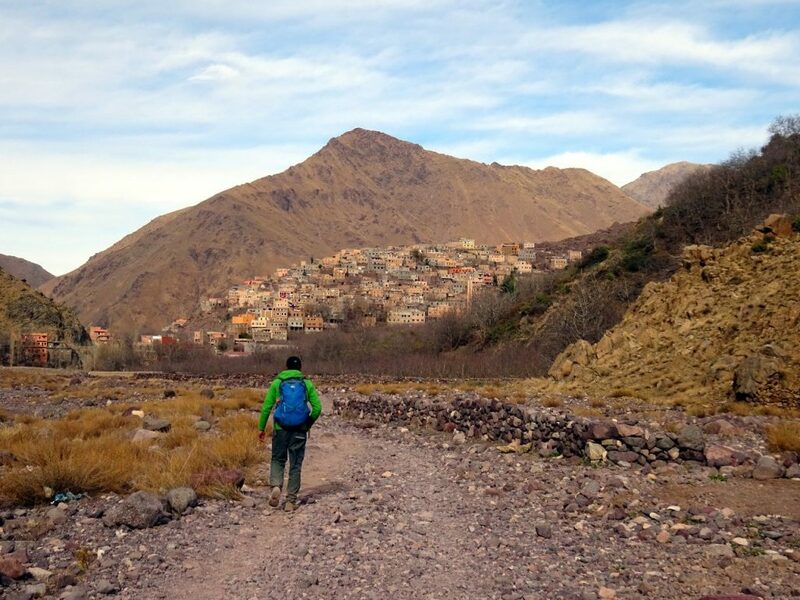 It was also a reminder that there is so much more to explore here in the Atlas Mountains of Morocco. This was my fourth visit, and every time I come here I like it a little more. You can see all the photos from our trip in my Flickr album.